At �Herb & Lou�s� (West Branch, Iowa) we became aware of at least two tables of senior ladies playing cards. Some had canes, walkers but left under their own power in the rain. Jennifer did help one out the door with her pocketbook and walker. Since childhood, I have had a serious interest in Presidents and history. In our travels around the United States, we have visited many Presidential birth places, libraries, museums and burial sites. Touring these places brings a closer connection with our national history. 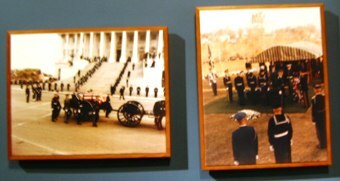 In the Mid-West, we found two Presidential Museums and burial sites: Gerald Ford at Grand Rapids, Michigan; Herbert Hoover at West Branch, Iowa. 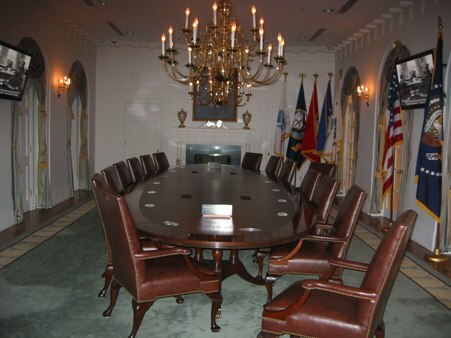 We spent considerable time at both places and enjoyed exhibits of events during those Presidencies. Because of the recent time of the Ford Presidency, a tour of the Ford Museum was a reminder of a tense time in our history. 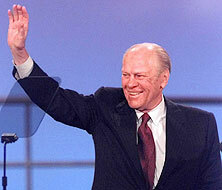 I liked and respected Gerald Ford and I think he was good for the country after the Nixon resignation. Herbert Hoover was blamed for the Great Depression. As I have aged and learned more history, I think Hoover may have had the misfortune of “being in the wrong place at the wrong time”. Hoover went on to do great humanitarian works and the museum has exhibits of that service. 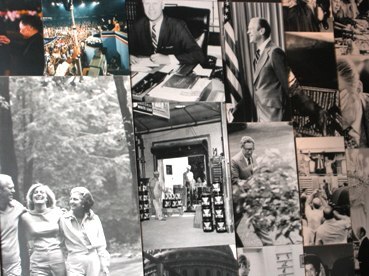 THE GERALD R. FORD PRESIDENTIAL MUSEUM in Grand Rapids, Michigan. 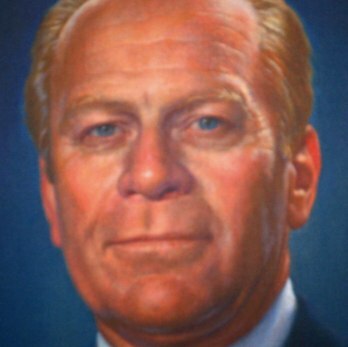 Gerald Rudolph Ford, Jr. (born Leslie Lynch King, Jr.) (July 14, 1913 – December 26, 2006) was the 38th President of the United States, serving from 1974 to 1977. 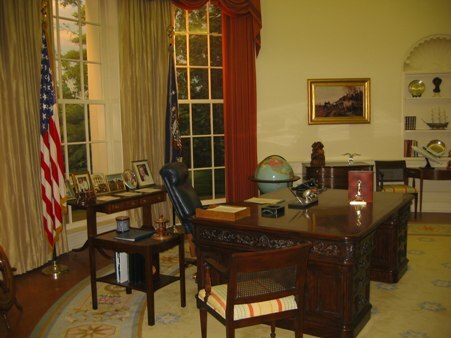 On July 18, 2009, we visited the Gerald R. Ford Presidential Museum in Grand Rapids, Michigan. We had spent the night on the outskirts of Grand Rapids after our 80 mile ferry trip across Lake Michigan from Milwaukee. Ford’s college football career was highlighted along with his long Congressional Career before he was Vice-President and later President. 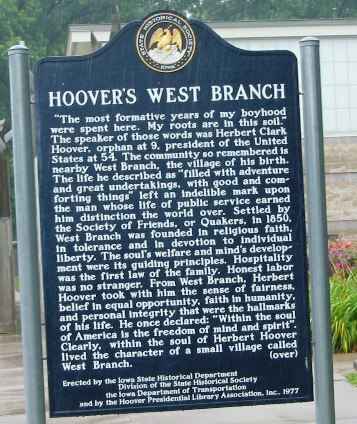 The Herbert Hoover Presidential Library-Museum is located in West Branch, Iowa, Hoover's boyhood home where he and his wife are buried. The Herbert Hoover Presidential Library-Museum was opened to the public on August 10,1962, Mr. Hoover's 88th birthday. 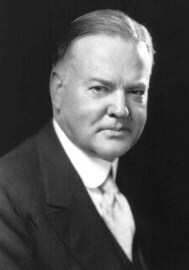 Herbert Clark Hoover (August 10, 1874 – October 20, 1964) was the 31st President of the United States (1929–1933). 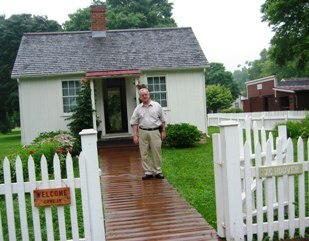 A blacksmith shop is located behind the Herbert Hoover birthplace and had an active blacksmith on duty the day we visited. 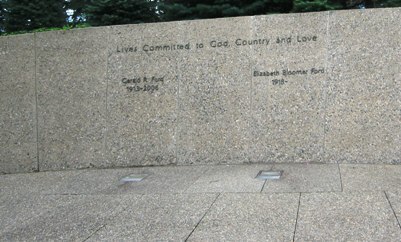 We stopped at West Branch, Iowa, on July 21, 2009, and toured the Herbert Hoover Presidential Library and Burial Site. It was raining the day we were there and we took pictures using umbrellas and ‘between showers”. West Branch is a small town with about 2,000 citizens. We looked for a restaurant and wound up at a Pizza restaurant called “Herb & Lou’s”, obviously named after the President and his wife. 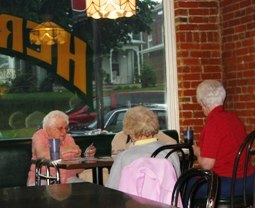 At “Herb & Lou’s” we became aware of at least two tables of senior ladies playing cards. Some had canes, walkers but left under their own power in the rain. Jennifer did help one lady out the door with her pocketbook and walker.